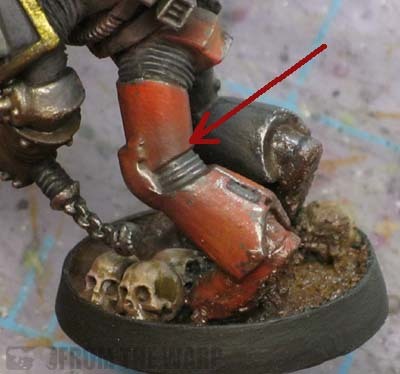 There are lots of ways to give your models that battle damaged look. Chipped paint, worn down edges, scratches, scrapes, etc... they're all in there. 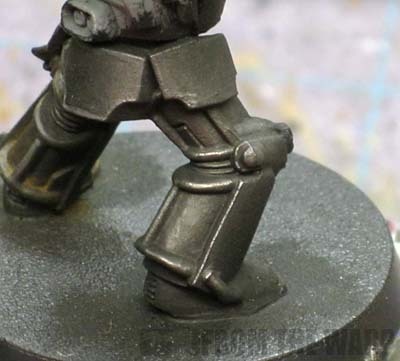 If you do any kind of weathering or battle damage to your models, you most likely have some variation of a "chipped paint technique" that goes something along the lines of use a tiny brush to apply a dark color to simulate to primer showing followed by the application of a metallic color in just a few places after that to show the bare metal underneath. I know I do. And you've probably got it down to a science to where you can apply it to a model quite fast to get the results you want. And then comes along this model. He's another test model for my friend just like the one I posted last week. 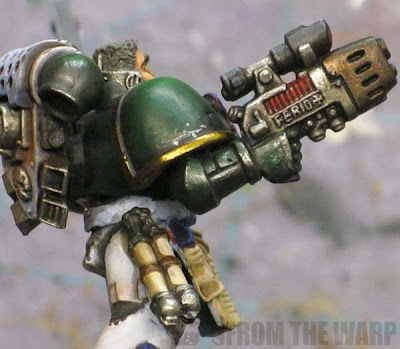 The one important thing I learned about this guy applies to weathering and creating that worn edge look to armour plates... with powder. I'd painted this guy up and added my battle damage by painting it on. I'd moved onto the point where I was applying powders and realized I'd forgotten to do the chipped paint look along the backpack exhaust vents. Being the lazy slug that I am, I didn't want to put away my powders and grab my metallic paint to touch up the exhaust vents. I figured I could use the Metallic Iron weathering powder I had at the back of my paint shelf to get a similar effect or at least close enough to pass for it. You see, I've had my "metallic" weathering powder for ages but have NEVER used it aside from the one time I tried to apply it to tank treads. Since then, it's sat quietly on the back of my shelf behind all my other weathering powders collecting dust. I've had no use for it to be honest. I even emailed misterjustin from Secret Weapon Minis to tell him it was a waste for me. When I picked up my first few powders from him, he sent this one along telling me how it was a "must have" powder. Sure... whatever. If you say so. If you can't see where this one is going, let me help you. I took the Metallic Iron powder and brushed it along the edges of the exhaust vents and of course it looks amazing. On top of that, it's just as fast as painting. If you look at the picture of his right arm up above, you can see where I tried to apply the powder to the armour plates on his arm as well. Doesn't look too bad actually. And then I thought, if it works there, it should work in other places too. I grabbed a few more models I had lying around and went to work. And I discovered a few things. Here's where the metallic powder effect works best I think. The little extra powder that collects away from the edge only serves to look like a subtle wearing down of the armour leading up to the edge. It's just a matter of brushing the powder over the raised edges and getting it to collect there. Like all other powder application, it's best done in multiple passes to build up the effect. It's easier to add more than it is to try and remove too much. When am I going to use it? Over my darker colors like black and dark blues, greys, etc. where I have an edge AND surrounding area that I want darkened slightly with the edge looking like it's worn down to the bare metal. Here's where the metallic powders don't really work for me. Since you're working over a lighter background color, the excess powder that collects around the edges makes the area look "dark." Not the effect I always want. It works over darker colors because you don't really see the excess powder. It's not going to work over the bone on my Deathwing models. When am I going to use it on lighter colors though? I'll use it on lighter colors like red, green and anything not super light as long as the darkening down effect fits in with the look I want. 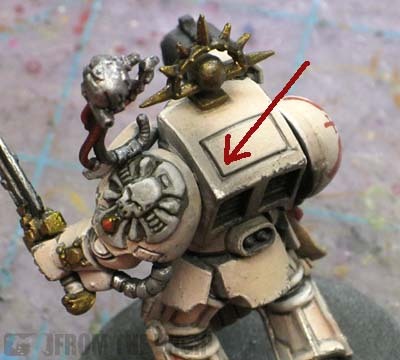 Maybe in those areas of a model that get worn down but still collect dirt and grime and such. Areas like under shoulderpads, backpacks and knee joints. Metallic weathering powder is definitely a "must have" for me now. I'm using Metallic Iron from Secret Weapon Miniatures. It's not going to work in every case, but when I have a model with darker colored armour and I want to give it a really nice worn down look along some of the edges, it's definitely going to be my preferred technique. The biggest down side to this whole technique is that the effect is really nice over black armour. 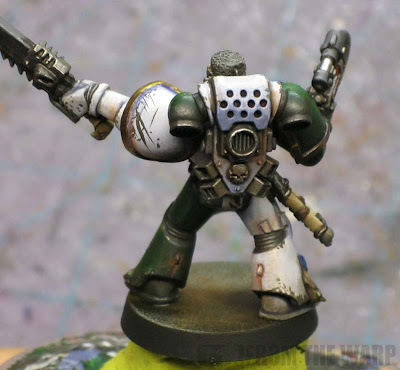 So much so that it has made me think twice about painting my Deathwing in the classic bone scheme. But the question still remains, what do I do in the case of lighter colored armour? I'll be going over that next. Why you don't try to make your own weathering powders. 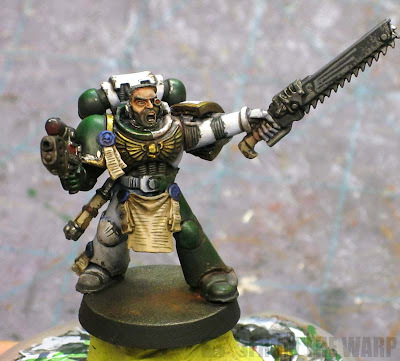 I love the emblem you put on that chainsword! Its subtle yet eye catching @ the same time. What are you using as an applicator, Ron, your brush or a rubber tipped tool of some sort? I know you've said you use your brush in the past, but this looks too precise for brush on powder work. One question I've always had about weathering powders...does it come off when you handle the miniature later? I would assume that you have to seal it with a varnish of some kind. Oooohhh... nice, Ron. I'm using Weathering Powders for more things since my Centurions and their vehicles, and plan to have fun with my Grey Knights with them. However, I had no idea about the Metallic Powders!!! Secret Weapon will be getting a call from me. Course, I'll be using non-metallic powders on my Grey Knights. but for my following projects? You better believe I'll be adding some to my arsenal. Your posts are always so inspiring. 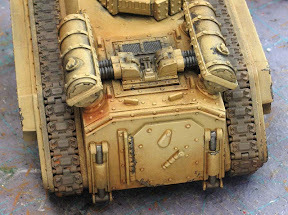 Great use of the weathering powders. I have a few coming in the next few days and I am really excited to try them out. Da Masta Cheef: I'm surprised you caught that. I set it on there to break up the black and see if I could paint something on there. Old School Terminator: It's some old brushed I've cut down to make into stipple brushes. Let me get some pics of the ones I use and I'll get them posted next week. I'd say sooner, but I have a ton of posts already scheduled to go up and they have some killer stuff in them. Darkwing: It can. But I don't play anymore to be honest and fixing them darkens most effects slightly. I need to work on that aspect myself and it could be the topic of another post. I want to try a few things. Tim Toolen: Sounds good. I want to try my hand at Necrons with them. Cameron: Thanks. The stuff I"m doing is just the tip of the iceberg as they say. There's so much more, but I'm still figuring it out myself. Grind off some graphite from a pencil and use that to rub on metal edges to make them pop. Looks great. I learned that trick from The Painting Clinic's YouTube videos. deathkorps: I've tried that as well. I'm a brush guy now, I use that to apply them most of the time now. skywatcher: It's a balance between cost and time. Sometimes I'll go the cheap route if it saves me a good bit of money AND it doesn't take all year to do. But other time,s I just fork over the cash and save myself the trouble of trying to do it on the cheap. Like changing the oil in my car. I can do it myself for $19 in supplies and an afternoon of work OR I can go to the mechanic who will do it for $20 and I keep my whole afternoon free.